The aim of the current investigation was to comparatively assess the influence of barefoot, CrossFit, minimalist and conventional footwear on the loads experienced by the Achilles tendon during running. Twelve male runners (27.81 ± 7.02 years, height 1.77 ± 0.11 cm and body mass 76.22 ± 7.04 kg) ran at 4.0 m·s-1 in each of the four footwear conditions. Achilles tendon forces were calculated using a musculoskeletal modelling approach allowing the magnitudinal and temporal aspects of the Achilles tendon force to be quantified. Differences between footwear were examined using one-way repeated measures ANOVA. The results showed the peak Achilles tendon force was significantly larger when running barefoot (5.81 ± 1.21) and in minimalist footwear (5.64 ± 1.03 BW) compared to conventional footwear (5.15 ± 1.05 BW). In addition it was revealed that Achilles tendon impulse was significantly larger when running barefoot (0.77 ± 0.22 BW.s) and in minimalist footwear (0.72 ± 0.16 BW.s) in comparison to both conventional footwear (0.64 ± 0.15 BW.s). Given the proposed association between high Achilles tendon forces and tendon degradation, the outcomes from the current investigation indicate that CrossFit athletes who select barefoot and minimalist footwear for their running training may be at increased risk from Achilles tendon pathology in comparison to conventional footwear conditions. 1 – Centre for Applied Sport and Exercise Sciences, School of Sport and Wellbeing, College of Health & Wellbeing, University of Central Lancashire, Lancashire, UK. CrossFit represents a relatively new activity associated with aerobic exercises, calisthenics, and Olympic weightlifting . CrossFit as a discipline has expanded to become an international sport which has been linked to significant gains in aerobic and anaerobic fitness . Given the novelty of CrossFit in relation to more established sports it has received a paucity of published attention in the sports science and strength and conditioning literature. A key feature of CrossFit training is aerobic conditioning and the manner in which this is examined during competition is via distance running events. Engagement in distance running mediates numerous physiological benefits but it is known to be associated with a high rate of chronic pathologies, with around 70 % of runners experiencing an injury injured during the course of a year [2,3]. Shorten proposes that athletic footwear with suitable mechanical features may be able to manage the incidence of chronic running related injuries . CrossFit athletes are able to select from a wide range of different footwear conditions with distinct design characteristics. There has been no peer reviewed research which has examined the biomechanical influence of different footwear available to CrossFit athletes. CrossFit specific footwear represents a hybrid footwear designed to incorporate the stability characteristics of a weightlifting shoe with the cushioning and flexibility of a running trainer. Currently, there is a trend for CrossFit athletes to opt to train and compete either barefoot or minimalist footwear in lieu of traditional footwear options, although the efficacy of barefoot and minimalist footwear is not yet fully established. The effects of different footwear on the loads experienced by the Achilles tendon have been examined previously. Sinclair examined the effect running barefoot had on minimalist and conventional footwear on Achilles tendon kinetics during the stance phase of running . The findings showed that peak Achilles tendon kinetics were significantly larger when running barefoot and in minimalist footwear. Similarly Sinclair et al, examined the effects of minimalist, maximalist and conventional footwear on the loads borne by the Achilles tendon during running . Their findings confirmed that peak Achilles tendon force and Achilles tendon impulse were significantly larger in minimalist footwear in relation to the conventional and maximalist conditions. Currently there are no published scientific investigations regarding the effects of barefoot, CrossFit, minimalist and conventional footwear on the loads experienced by the Achilles tendon. Therefore the aim of the current study was to comparatively examine the influence of barefoot, CrossFit, minimalist and conventional footwear on the loads experienced by the Achilles tendon during the stance phase of running. Given that running activities are associated with a high incidence of chronic Achilles tendon pathologies, the current investigation may deliver key information to CrossFit athletes concerning the selection of suitable footwear. Thirteen male participants took part in this investigation. All uninjured at the time of data collection and written informed consent was obtained. The mean and standard deviation (SD) characteristics of the participants were: age 27.81 ± 7.02 years, height 1.77 ± 0.11 cm and body mass 76.22 ± 7.04 kg. The research design utilized for this investigation was approved by the University of Central Lancashire, Science, Technology, Engineering and Mathematics, ethical committee. Participants ran at 4.0 m·s-1 (±5%), while striking an embedded piezoelectric force platform (Kistler, Kistler Instruments Ltd., Alton, Hampshire) which sampled at 1000 Hz. Participants struck the platform with their right foot which was used for analysis. Running velocity was monitored using infrared timing gates (Newtest, Oy Koulukatu, Finland). The stance phase was delineated as the duration over which 20 N or greater of vertical force was applied to the force platform. Runners completed five trials in each footwear condition. The order that participants ran in each footwear condition was randomized. Kinematics and ground reaction forces data were synchronously collected. Kinematic data was captured at 250 Hz via an eight camera motion analysis system (Qualisys Medical AB, Goteburg, Sweden). Dynamic calibration of the motion capture system was performed before each data collection session. Lower extremity segments were modelled in 6 degrees of freedom using the calibrated anatomical systems technique . To define the segment coordinate axes of the foot and shank, retroreflective markers were placed unilaterally onto the 1st metatarsal, 5th metatarsal, calcaneus, medial and lateral malleoli, medial and lateral epicondyles of the femur. A carbon fiber tracking cluster was positioned onto the shank segment and the foot was tracked using the 1st metatarsal, 5th metatarsal and calcaneus markers. The center of the ankle joint was delineated as the midpoint between the malleoli markers . Static calibration trials were obtained allowing for the anatomical markers to be referenced in relation to the tracking markers/ clusters. The Z (transverse) axis was oriented vertically from the distal segment end to the proximal segment end. The Y (coronal) axis was oriented in the segment from posterior to anterior. Finally, the X (sagittal) axis orientation was determined using the right hand rule and was oriented from medial to lateral. Dynamic trials were digitized using Qualisys Track Manager in order to identify anatomical and tracking markers then exported as C3D files to Visual 3D (C-Motion, Germantown, MD, USA). Ground reaction force and marker trajectories were smoothed using cut-off frequencies of 50 and 12 Hz using a low-pass Butterworth 4th order zero lag filter. All data were normalized to 100% of the stance phase then processed trials were averaged. Joint kinetics were computed using Newton-Euler inverse-dynamics. To quantify net joint moments anthropometric data, ground reaction forces and angular kinematics were used. Average Achilles tendon load rate was quantified as the Achilles tendon force divided by the time over which the peak force occurred. Instantaneous Achilles tendon load rate was also determined as the peak increase in Achilles tendon force between adjacent data points. In addition to this Achilles tendon force, impulse was quantified during running by multiplying the Achilles tendon force estimated during the stance phase by the stance time. The footwear used during this study consisted of conventional footwear (New Balance 1260 v2), minimalist (Vibram five-fingers, ELX) and CrossFit (Reebok CrossFit CR) footwear, (shoe size 8–10 in UK men’s sizes). Means and standard deviations were calculated for all footwear conditions. Differences in Achilles tendon parameters between footwear were examined using one-way repeated measures ANOVAs, with significance accepted at the P≤0.05 level. Effect sizes were calculated using partial eta2 (pη2). Post-hoc pairwise comparisons were conducted on all significant main effects. The data was screened for normality using a Shapiro-Wilk which confirmed that the normality assumption was met. All statistical actions were conducted using SPSS v22.0 (SPSS Inc., Chicago, USA). 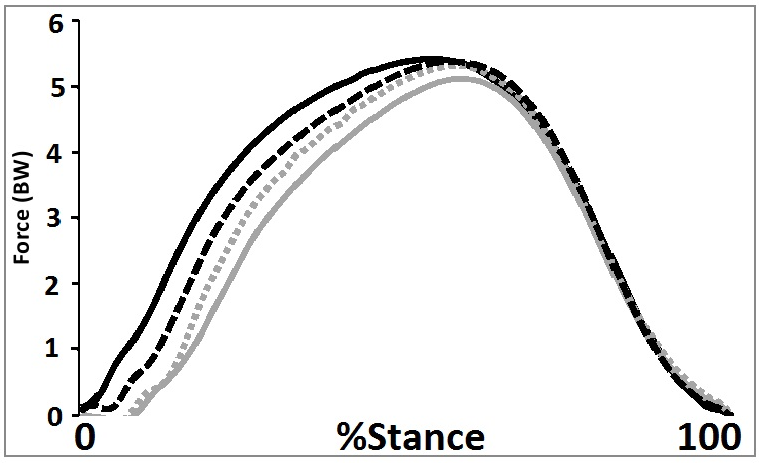 Table 1 and Figure 1 present the Achilles tendon loads during the stance phase of running, as a function of the different experimental footwear. The results indicate that the experimental footwear significantly influenced Achilles tendon force parameters. Table 1 Achilles tendon forces as a function of footwear. Figure 1 Achilles tendon forces during the stance phase as a function of footwear (black = barefoot, dash = minimalist, grey = conventional, grey dot = CrossFit). A main effect (P<0.05, pη2 = 0.21) was shown for the magnitude of peak Achilles tendon load. Post-hoc pairwise comparisons showed that peak Achilles tendon force was significantly larger in the barefoot (P=0.01) and minimalist (P=0.04) conditions in relation to conventional footwear. A main effect (P<0.05, pη2 = 0.43) was shown for the time to peak Achilles tendon load. Post-hoc pairwise comparisons showed that time to peak Achilles tendon force was significantly larger in the barefoot (P=0.001) and minimalist (P=0.007) conditions in relation to conventional footwear. In addition time to peak Achilles tendon force was significantly shorter in the barefoot condition (P=0.007) in relation to the CrossFit footwear. In addition a main effect (P<0.05, pη2 = 0.29) was evident for average Achilles tendon load rate. Post-hoc analysis showed that average load rate was significantly larger in the barefoot (P=0.004), CrossFit (P=0.04) and minimalist (P=0.02) conditions in relation to the conventional footwear. A main effect (P<0.05, pη2 = 0.25) was found for instantaneous Achilles tendon load rate. Post-hoc pairwise comparisons showed that instantaneous Achilles tendon load rate was significantly larger in the barefoot (P=0.01), CrossFit (P=0.003) and minimalist (P=0.01) conditions in relation to the conventional footwear. Finally, a main effect (P<0.05, pη2 = 0.34) was observed for Achilles tendon impulse. Post-hoc analyses indicated that Achilles tendon impulse was significantly larger in the barefoot (P=0.007) and minimalist (P=0.04) conditions in relation to conventional footwear. The aim of the current investigation was to comparatively examine the influence of barefoot, CrossFit, minimalist and conventional footwear on the loads experienced by the Achilles tendon during running. To the authors knowledge the current study represents the first comparative examination of Achilles tendon kinetics when running in these specific footwear conditions. The key observation from the current study is that Achilles tendon force parameters were significantly larger in the barefoot and minimalist conditions in relation to the conventional running shoes. This observation is in agreement with those of Sinclair  and Sinclair et al. who similarly noted that barefoot and minimalist footwear conditions were associated with significant increases in Achilles tendon kinetics in relation to more substantial running footwear. This observation may provide important clinical information with regards to the etiology of Achilles tendon pathologies as a function of running activities in CrossFit athletes. The initiation and progression of Achilles tendonitis is mediated by excessive tendon loads that are applied without sufficient cessation between activities . Mechanisms of tendon loading that are above the systematic threshold for collagen related synthesis lead ultimately to degradation of the collagen network as the rate of resynthesis is not able to keep pace with the rate of breakdown . Therefore the findings from the current investigation indicate that running barefoot and in minimalist footwear may place CrossFit athletes performing running activities at a greater risk from Achilles tendon pathology. The specific findings from the current study may be explained by taking into account the effects of running barefoot and in minimalist footwear on the sagittal plane mechanics of the ankle joint. When running barefoot and wearing minimalist footwear, runners adopt a more plantarflexed foot position throughout the stance phase in relation to more structured running shoes [12, 13]. Increased ankle plantarflexion serves to reduce the length of moment arm of the Achilles tendon . If the moment arm is shortened, this mediates an increase in the load which must be borne by the tendon when running barefoot and in minimalist footwear. Research which has examined the influence of different footwear condition on the loads borne by the Achilles tendon during the stance phase of running, habitually examines only the peak forces experienced per footfall. Because running barefoot and in minimalist footwear mediates alterations in stance times and step frequencies, the time integral of loads experienced by the Achilles tendon are not quantified. The current study addresses this by quantifying the impulse experienced by the Achilles tendon during the stance phase which is a reflection of both the load experienced and the time interval of the load. The findings from the current investigation in relation to the Achilles tendon impulse mirror those of Sinclair et al., in that barefoot and minimalist footwear were associated with significantly larger impulse in relation to conventional running shoes . This therefore further supports the notion outlines above that running barefoot and in minimalist footwear may increase the likelihood of experiencing an Achilles tendon injury compared to conventional running shoes. In conclusion, although differences in Achilles tendon loading as a function of different footwear conditions has been examined previously, the current knowledge with regards to the effects of minimalist, barefoot, CrossFit and conventional footwear on Achilles tendon forces is limited. As such the present study therefore adds to the current knowledge by providing a comprehensive evaluation of Achilles tendon load parameters when running in minimalist, barefoot, CrossFit and conventional footwear. On the basis Achilles tendon load and impulse parameters were shown to be significantly greater when running barefoot and in minimalist footwear, the outcomes from the current investigation indicate that CrossFit athletes who select barefoot and minimalist footwear for their running training may be at increased risk from Achilles tendon pathology in comparison to conventional footwear conditions. Weisenthal, B. M., Beck, C. A., Maloney, M. D., DeHaven, K. E., & Giordano, B. D. (2014). Injury rate and patterns among CrossFit athletes. Orthopaedic Journal of Sports Medicine (In press). Shorten, MA. Running shoe design: protection and performance. pp 159-169 in Marathon Medicine (Ed. D. Tunstall Pedoe). 2000; London, Royal Society of Medicine. Sinclair, J., Richards, J., & Shore, H. (2015). Effects of minimalist and maximalist footwear on Achilles tendon load in recreational runners. Comparative Exercise Physiology, 11(4), 239-244. Self, BP, Paine, D. Ankle biomechanics during four landing techniques. Medicine & Science in Sports & Exercise 2001; 33: 1338–1344. Lieberman, D.E., Venkadesan, M., Werbel, W.A., Daoud, A.I., D’Andrea, S., Davis, I.S., & Pitsiladis, Y. (2010). Foot strike patterns and collision forces in habitually barefoot versus shod runners. Nature, 463, 531-535. Sinclair, J., Greenhalgh, A., Brooks, D., Edmundson, C. J., & Hobbs, S. J. (2013). The influence of barefoot and barefoot-inspired footwear on the kinetics and kinematics of running in comparison to conventional running shoes. Footwear Science, 5, 45-53.